Pinball Magazine has released its 5th yearly 360-page magazine. The first edition in this style was originally launched in 2012. The new issue released on August 30, 2018 is the magazines biggest issue ever. 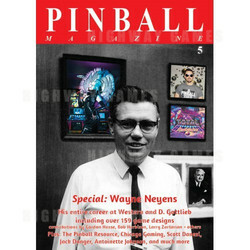 This edition includes two in-depth articles on 100-year old pinball legend Wayne Neyens. Included is an interview and an overview of his career. Other features of this edition include a discussion with Scott Danesi on his design process of Spooky Pinball's best selling Total Nuclear Annihilation, Jack Danger discusses streaming pinball on his Dead_Flip channel, Gary Stern discusses Stern Pinball's current business model plus much more. The magazine is managed and directed by Jonathan Joosten who took over in 2006. At that time, the magazine was A3 sized black and white photocopies stitched and folded to A4. Joosten is assisted by a team of editors. "I'm really happy how this issue turned out in print," said Joosten. To order your copy of Pinball Magazine No.5, click here.